Remains of the former Pinetree facility at Alsask, Saskatchewan. Throughout the period of the Cold War, the province of Saskatchewan was home to a number of air defence radar stations. These were set up to protect North America from the threat of a nuclear attack by manned bombers from the Soviet Union (USSR). Pinetree Radar Line. In 1951 the Canadian and American governments entered into an agreement to construct 44 strategically located radar stations to counter the Soviet air threat against North America. The system, known as the Pinetree Line, entered service in 1954. The radar stations were fully manual air defence systems with both aircraft control and early warning functions. Primarily built to defend the industrial heartland, most of these radar stations were located in eastern Canada and were manned by the United States Air Force (USAF). The Royal Canadian Air Force (RCAF) manned Saskatchewan's three Pinetree radar sites: Alsask (1963-86), Dana (1964-87), and Yorkton (1963-86). 46 Radar Squadron, Yorkton. Construction for RCAF Station Yorkton (C-51), one of the last CADIN/Pinetree stations built, began in 1961 at a location approximately 14.5 miles northwest of the city of Yorkton. The site, declared operational on October 15, 1963, was a Long Range Radar (LRR) and Ground Air Transmitter Receiver (GATR) facility. 46 Radar Squadron became a self-accounting unit in January 1963. The station, known officially as 46 Radar Squadron Yorkton, initially reported to the Minot North America Air Defence Command (NORAD) Sector, part of the 29th NORAD Region. 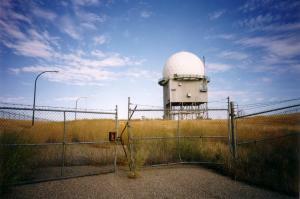 On May 15, 1963, 46 Radar began reporting to the Great Falls NORAD Sector. 46 Radar Squadron Yorkton was renamed Canadian Forces Station Yorkton on May 12, 1967. On October 17, 1968, CFS Yorkton began to report to Central NORAD Region through the 28th NORAD Division. In August 1984, Yorkton formed part of the Canada West Region Operation Control Centre (ROCC). The site continued in its long-range radar role until it ceased operations in December 1985. On August 1, 1986, the Minister of National Defence authorized the disbanding of a number of radar stations, including Yorkton. 45 Radar Squadron, Dana. Construction of the Station (C-52) commenced in September 1961 and was completed in December 1962. 45 Radar Squadron, RCAF Station Dana received its first RCAF personnel on October 8, 1962, and was declared operational on February 3, 1964. The station was equipped with the AN/FPS 26, AN/FPS 27, AN/FPS 507 radars as well as the FTS-2 Data Processor and the obligatory GATR Site. The station was renamed 45 Radar Squadron, Dana in 1964. In February 1968 the station's name was changed to Canadian Forces Station Dana. 45 Radar Squadron originally reported to the Minot Sector, later reporting to Great Falls and the 28th NORAD Region. In 1983, the squadron began reporting directly to North Bay. The radar station at Dana, also known as Sagehill, was located 35 miles east of Saskatoon. RCAF Station Dana was supported by RCAF Station Saskatoon until it was closed in mid-1964. One of the station's height-finders ceased operation on April 1, 1975. In 1983, as a result of the Canadian NORAD Region's introduction of two Regional Operations Control Centres (ROCCs), CFS Dana became part of Canada West ROCC. 45 Radar Squadron, Dana was closed in late summer of 1987. 44 Radar Squadron, Alsask. Construction began at Alsask (C-53) in January 1961, and on November 1, 1962, RCAF Station Alsask was officially established. The long-range radar unit, 44 Radar Squadron, became operational in early 1963. Equipment at the Station included the FPS-7C Search and FPS 507 and FPS 206 Height Finder radars. The site reported to the 24th NORAD Region. The Station's name was later changed to 44 Radar Squadron Alsask, and remained so until it became a Canadian Forces station in May 1967. The radar station was located at the junction of provincial Highways 7 and 44, on the border of Alberta and Saskatchewan, hence its name. The nearest community was the village of Alsask, which bordered the southern boundary of the 418-acre military facility. Alsask continued to operate until it was disbanded on August 1, 1986. Mid-Canada Line. The Mid-Canada Line was a detection system, designed at McGill University, that was based on the doppler principle. This system was proposed as a defence line as early as 1951; however, it was not established until October 1953. Although Saskatchewan did not have any manned Mid-Canada Line sites, there were several unmanned sites situated between RCAF Cranberry Portage, Manitoba (47 km southeast of Flin Flon), and RCAF Stoney Mountain, Alberta (close to Anzac, Alberta, 32 km south of Fort McMurray). Prince Albert Radar Laboratory. Air Defense Command (ADC) also gained the ability to track satellites with the Satellite Tracking Unit in Cold Lake and a detachment at the Prince Albert Radar Laboratory (PARL). The Satellite Tracking Unit was equipped with a Baker-Nunn tracking camera. By 1962 these units were working on a full-time Space Detection and Tracking System (SPADATS) basis. Initially these units received their “look angles” (the angle to position the camera to view a satellite) from the SPADATS Centre in Colorado Springs, but the workload on their Philco computer necessitated that units calculate their own look angles. This was done by a digital computer with information from SPADATS. Ground Observation Corps. Many members of the Ground Observation Corps (GObC) were located in northern Saskatchewan. Before the advent of the Mid-Canada and Pinetree Radar Lines, a number of civilian volunteers reported any air movements in northern Canada to their respective headquarters. The two squadrons responsible for western Canada were 20 RCAF GObC Squadron, Edmonton and 51 RCAF GObC Squadron, Winnipeg.